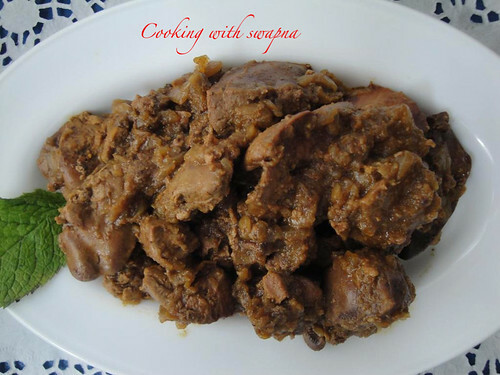 Chicken liver fry is pravin's favourite side dish for rotis. I am not a great lover for this dish before marriage. 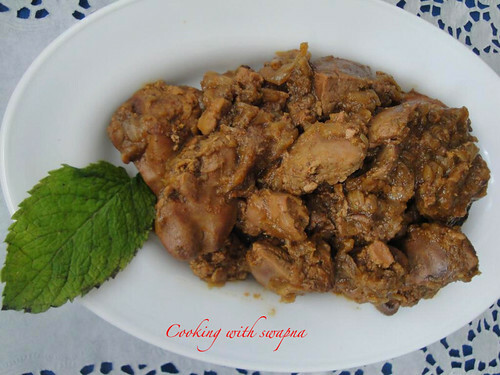 But things have changed after tasting this yummy chicken liver fry sauted in Indian spices. It takes less time to make this side dish & it taste great with both chapathis and rice as well. 1. Clean & cut the chicken liver. Keep aside. 2. Heat oil in the heavy bottomed pan, add cinnamon & cloves. Lets splutter. 3. Add the finely chopped onions & saute. Add ginger garlic paste. 4. Add finely chopped tomatoes & salt. Saute for 5 min. 5. Add turmeric powder, chilly powder & chicken liver. Cover and cook until tender. 6. Finally add the black pepper powder & saute till combined. Looks yummy and tempting. And nicely presented. Gosh,thats a unique recipe..loved the presentation..tempting..! !